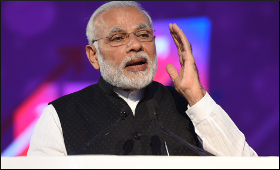 Prime Minister Narendra Modi, will lay the foundation stone of India International Convention and Expo Centre (IICC) in New Delhi, Thursday. The IICC is being developed as a state of the art centre to promote meetings, incentives, conferences and exhibitions (MICE) activities to attract and promote business and industry for growth of industrial development in the country. The project is planned over an area of 221.37 acres in Sector 25 Dwarka, New Delhi,at an estimated cost of Rs.25,703 crores. The facilities provided at the centre will be on par with the best in the world in size and quality, offering setting for international and national events, meetings, conferences, exhibitions and trade shows. It will rank among the top 10 in the world and the biggest indoor exhibition space in India. Apart from giving boost to business and industry it is also expected to generate over 5 lakh employment opportunities. IICC will be an integrated complex with a host of mutually beneficial facilities like exhibition halls, convention centre (comprising plenary hall, ball room and meeting rooms), a multi-purpose arena, open exhibition spaces, mixed use commercial spaces like star hotels (5,4 and 3 star), retail services and high-end offices. The facilities are designed with sustainable approaches in planning and design, transportation, alternative energy production, energy conservation, water resource management, solid waste management, efficient land use, eco-friendly building design to create cost-effective and measurable savings for the project. The construction will be in line with green building principles and Indian Green Building Council (IGBC) Platinum rating standards. The project will be developed in two phases. Phase-I will be completed by December 2019 with convention centre and two exhibition halls with adjoining foyer and related support facilities. Phase-II will be completed by December.